Created for openings up to 10’W x 10’H, the series “R” inflatable rail shelter provide the optimum airtight insulated passage from the loading dock to the railcar. The insulated pressure against the railcar creates a gasket sealing effect that is maintained during operations regardless of wind or car movement. Unique roller retraction system deflates quickly when motor is turned off without the use of shock cords. 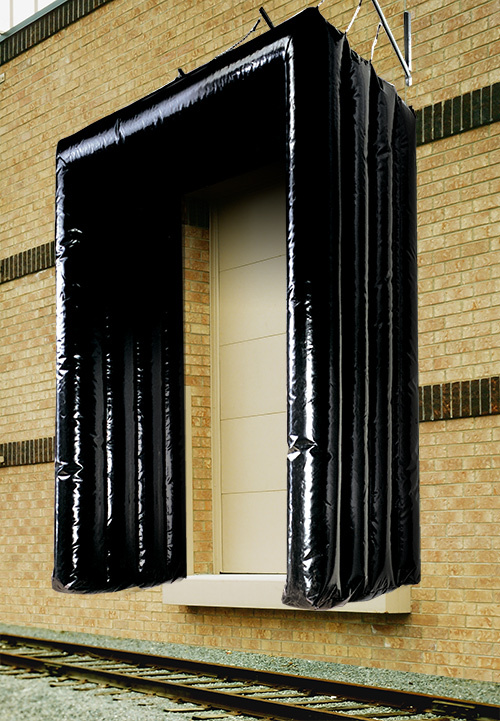 This model creates an optimum seal that blocks out unwanted weather or debris. Three sided unit standard dimensions for door openings 10′ wide X 10′ high are 12′ wide X 11′ high (O.D.) with a 48” projection, and a 12” wide face across the air bags when inflated. The air bag unit to be one (1) piece unitized construction consisting of two (2) verticals and one (1) header member. The air bag is fastened onto a 2” X 12” select kiln-dried pressurized wood frame, through brass plated grommets using galvanized wood screws. The bottom of the vertical seals to include brass plated grommets for venting of air and to assist in moisture drainage. The top of the unit shall be sloped to shed water down the sides. Each unit includes an externally mounted 1/2 HP, 115 V, 60/50 Hz, 1400 RPM motor/blower complete with a manual ON/OFF switch with neon pilot light and a galvanized steel protective hood. Automatically inflated when motor is on and automatically deflates when motor is not in use. Double stitched, high strength twisted 4 ply 100% polyester bonded thread UV treated used for sewing throughout. The series “R” rail shelter can be part of a totally automated dock loading system.